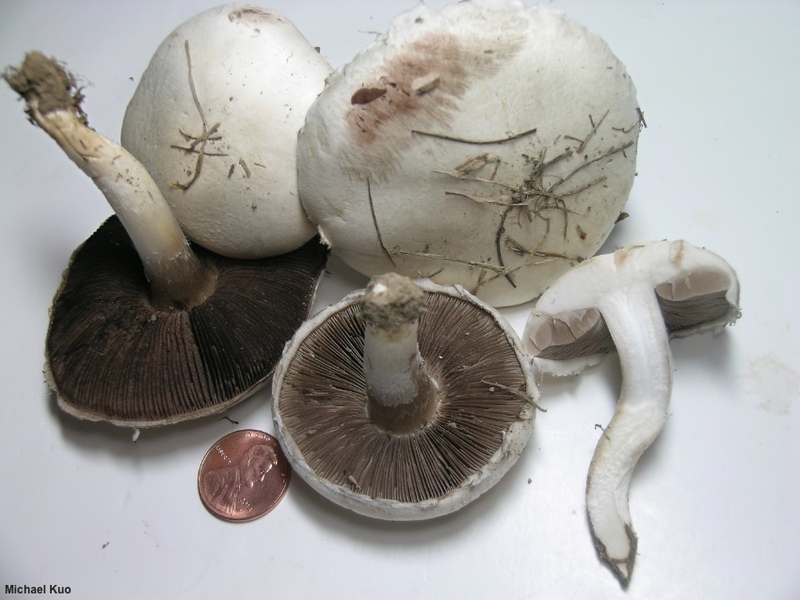 This is the large-spored eastern North American version of "Agaricus campestris," inseparable from similar species without either measuring spores or sequencing DNA. According to Kerrigan (2016), Agaricus argenteus is "[l]ikely to have been called A. campestris in much North American literature." The spores of Agaricus argenteus are regularly more than 8 µm long— somewhat longer than the spores of the otherwise indistinguishable Agaricus andrewii. 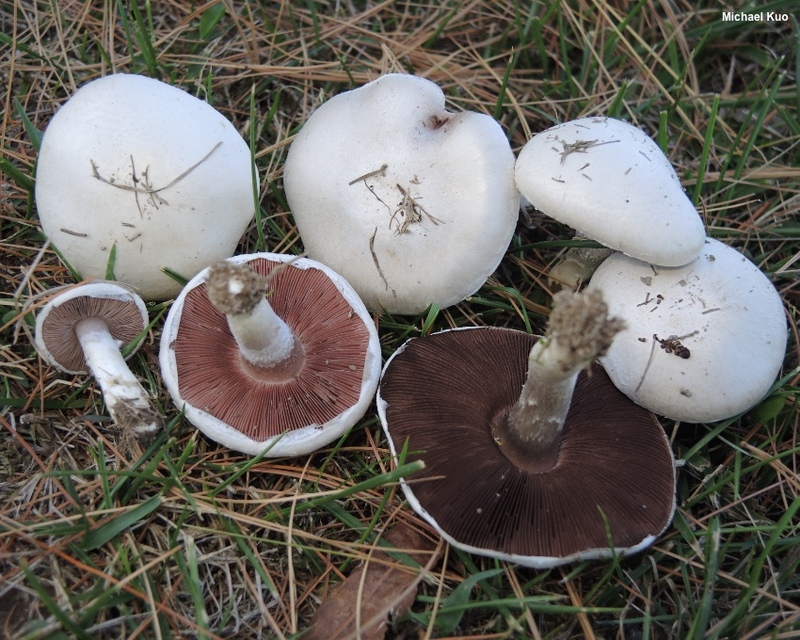 Like other species in the group Agaricus argenteus grows in grass and features a whitish cap, gills that progress from pink to brown, and a pointed stem base. By maturity the ring is usually collapsed and not prominent. Peck's original description of Agaricus argenteus, which was apparently based on correspondence and specimens sent to him from Washington, D. C. by F. J. Braendle, is a bit confusing with respect to the gills of the species, which he says "sometimes become moist and manifest a tendency to deliquesce" and which are "at first brownish" and are "peculiar . . . in the absence of any pink hues." I'm not sure what to do with the business about the deliquescing gills, other than to chalk it up to misinterpreting something communicated by Braendle, but the young gills of specimens sent to Peck in upstate New York from our nation's capital in the late 19th century, even if they had ridden the train and been delivered in person, would likely lose the pink tones that do, indeed, characterize the gills of this and related species; buttons sitting just a few hours on a countertop will develop brownish, maturing gills. And we are relatively sure Peck did not received already-dried specimens, since he notes that "[t]he drying specimens emit a strong but not unpleasant odor." A subspecies of Agaricus argenteus with appressed brown fibrils on the cap, Agaricus argenteus subsp. annetteae, is documented by Kerrigan (2016) from western North America (California and Alaska); it is "probably widespread but the range is uncertain for now." Ecology: Saprobic; growing gregariously, or in arcs or fairy rings, in grass; fall; possibly widely distributed from the Great Plains eastward. The illustrated and described collection is from Illinois. 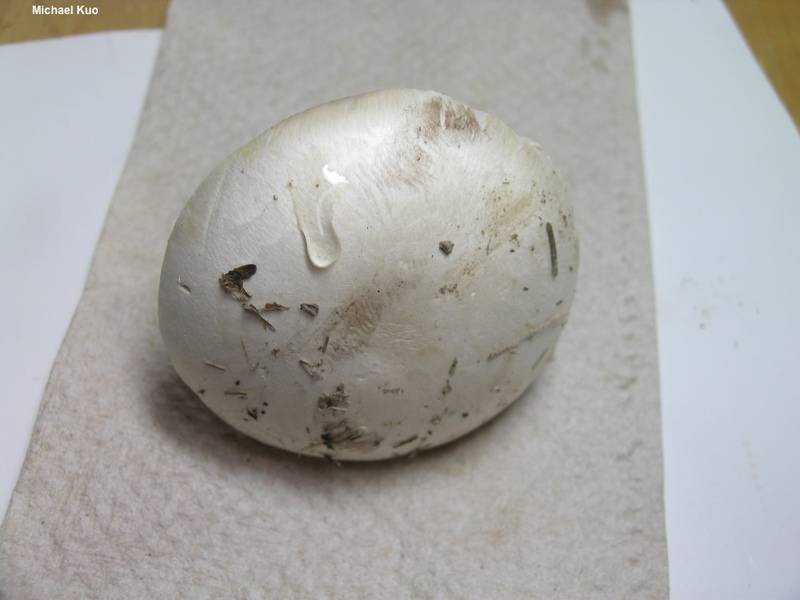 Cap: 3–7 cm; convex at first, becoming broadly convex; dry; shiny and bald; whitish to buff; not bruising; the young margin often hung with white veil remnants. Gills: Free from the stem; crowded; short-gills frequent; pink when young, but quickly becoming brownish and eventually dark brown; when in the button stage covered with a whitish partial veil. 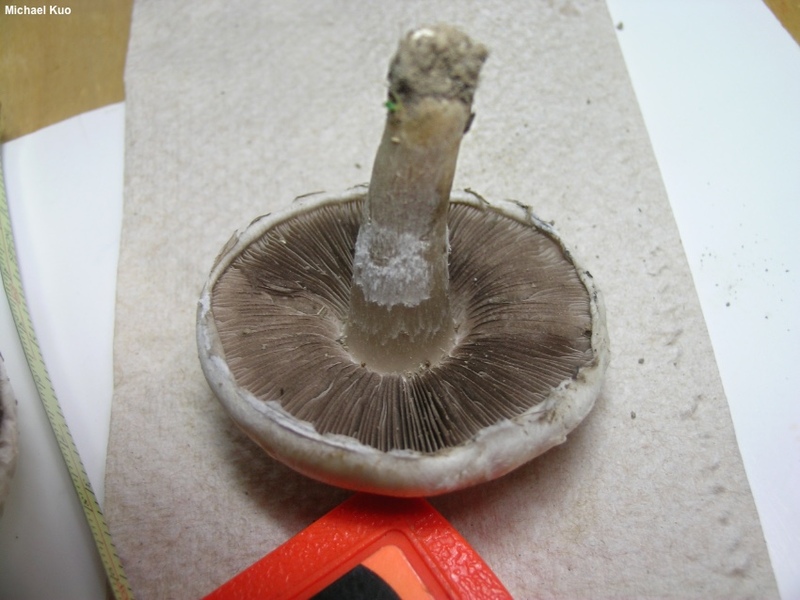 Stem: 3–6 cm long; 1–1.5 cm thick; equal above a tapered base; more or less bald; with a fragile, collapsing, white ring; whitish; not bruising; basal mycelium white. 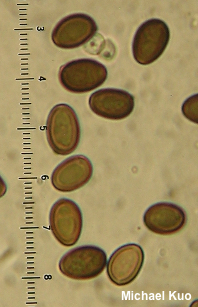 Microscopic Features: Spores: 7.5–9 x 5.5–6.5 µm; ellipsoid; smooth; thick-walled; brown in KOH; brown in Melzer's. Basidia 4-sterigmate. Cheilocystidia not found. Pleurocystidia not found. Pileipellis a cutis; elements 5–7.5 µm wide, smooth, hyaline in KOH. REFERENCES: Braendle, in Peck, 1899. (Peck, 1899; Weber & Smith, 1985; Kerrigan, 2016.) Herb. Kuo 09099401, 10071701.